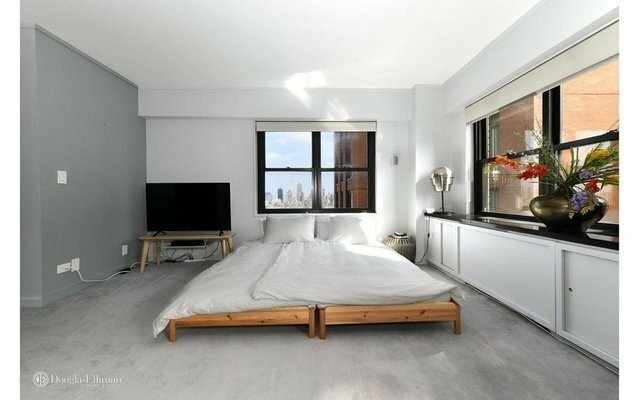 This incredibly flexible loftlike space boasts full Central park and city views. The updated kitchen features granite countertops, wood-like floors, mirrored and granite backsplash, Miele dishwasher and a GE Profile stove. The contiguous dining area also houses a Murphy bed, thereby potentially creating a 3rd sleeping space, all while facing Central Park and offering magnificent views. The 2nd bedroom and its ensuite bath face the park as well. This bedroom is closed off with a built-in wall screen that can alternatively be left opened. However, this area can easily be utilized/transformed into the living room. Some other lovely features include custom granite and wooden built-ins covering the through-the-wall air conditioning units, blackout shades, 3 closets in the master bedroom, built-in bookshelves and moldings. Laundry facilities on each floor. This full service condo, located in the heart of Lincoln Center, offers fantastic amenities, including a rooftop swimming pool (perched high above the city on the 44th floor, thereby offering tremendous views), a well equipped health club ($1,076.35/person/year (includes classes, sauna, steam room, gym and Wifi), various communal outdoor areas to enjoy, and a parking garage. Sorry, NO PETS.